You may have already seen Peeled Snacks at your grocer and thought about trying them out. Before I tried them I seen them at my local market and wasn’t sure how my husband and kids would like them. You can tell by the packaging they are not bad for you and actually might be pretty heathy. I’m not a big chip and snack eater but my husband and kids are. 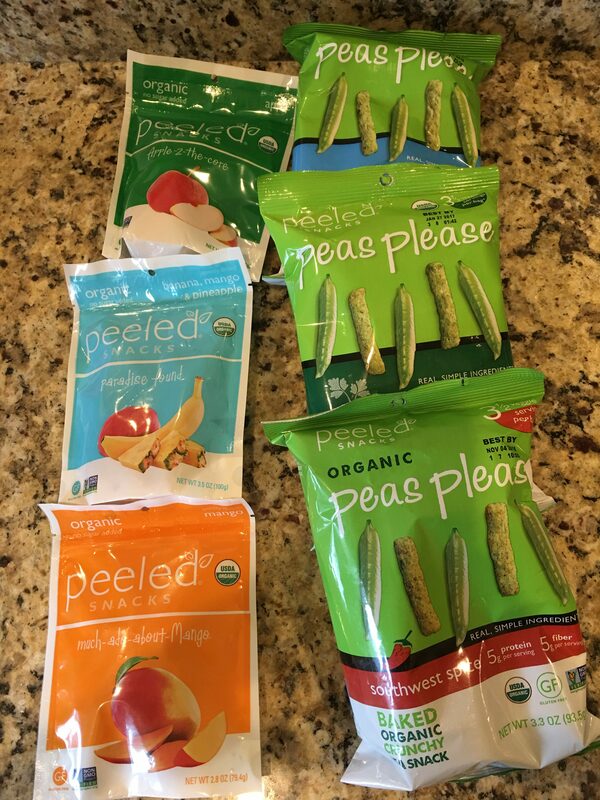 When I was sent a different assortment of Peeled Snacks to try out I let them try them out first.My husband who is pretty picky about snacks really liked the Peas Please snack.The Peas Please is a crunchy snack that has 3.5 servings of veggies in each bag! There are 4 different floors to choose from in the Peas Please, Sea Salt, Southwest Spice, White Cheddar and Garden Herb. All the snacks are organic, non GMO and Gluten Free. These are perfect for back to school. I was also sent their dried fruit snacks. The flavors are Apple, mango, Paradise found and Banana. My daughter loved the fruit snacks the best. She always has a sweet tooth and these hit the spot. She wanted to take them everywhere and would bring them in the car with her. They are dried fruit that is also organic, non GMO and gluten free. These snacks are perfect to keep around because they are pretty guiltless. There are a lot of snacks at the store that might be organic but they have ingredients that are not so great but these are great. You can check out their website at Peeledsnacks.com to get more information. I have seen them sold at Target and local grocery stores. On their website you can find a list of local stores to purchase them at. They can also be found on Amazon.